Three days of sunrises and sunsets gave me the chance to explore areas away from the well-known sunrise spot at Angkor Wat. That way, I can now present to you my top five sunrise or sunset spots amongst the temples of Angkor. The sunrise spot in front of Angkor Wat is touristy for a reason. The view of the temple with the sky turning blue and red behind it is stunning. This is the only place in the park where you can get a good silhouette picture for sunrise. Unfortunately, its beauty is not a secret, so expect to share the spot with many more people. But while this is not a place for quiet and contemplation, it is one that you should not miss and if you only get the chance to see one single sunrise, make it this one. If you arrive the moment the park opens, you might be lucky and get to experience the dawn of the day by yourself before the other tourists arrive. Don’t come here expecting to take a pretty silhouette picture. 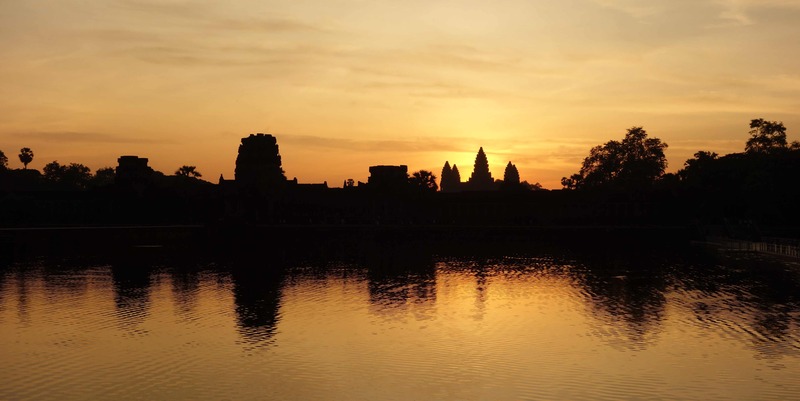 If that’s what you’re after, you need to watch sunrise at Angkor Wat. But if you want a place that is more quiet and from where you have a good view of the jungle, Pre Rup is where you want to go. When we arrived at Pre Rup early in the morning, about half an hour after sunrise, we were the only visitors. Even for sunset, the temple was nowhere near as busy as other spots in the park. Each sunrise is different, depending not only on your location but also on the colours in the sky. Concerning the latter, our sunrise at Sra Srang was the most spectacular one. The whole sky turned red and orange. Sra Srang is a pool with ancient Khmer stone steps. You can sit on them and ponder while the sun rises up behind the jungle and reflects beautifully in the pond. Once again, you will not have a silhouette picture of a temple but you will have a quiet and peaceful morning before hitting the temples. 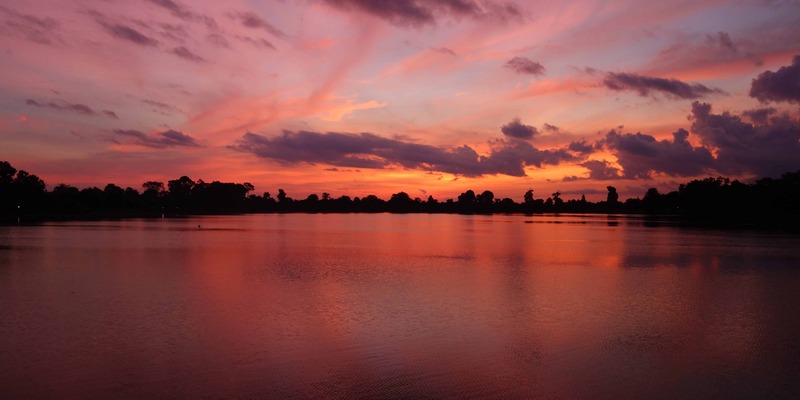 Phnom Bakheng is the most popular sunset spot in the park. Located on top of the hill, this temple offers sweeping views from Angkor Wat to the Jayatataka Baray, a huge artificial lake west of Angkor Wat. The sun reflects on the lake as it goes down and if you position yourself well, you can get a silhouette picture of one of the small towers on top of the temple. 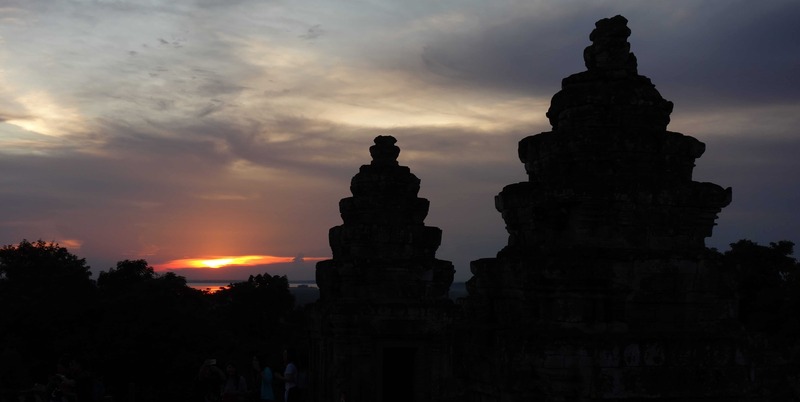 The number of visitors allowed on Phnom Bakheng is limited so make sure to arrive early enough to grab a spot. Also, as with all popular spots, this is not a place where you want to come if you are expecting peace and quiet. 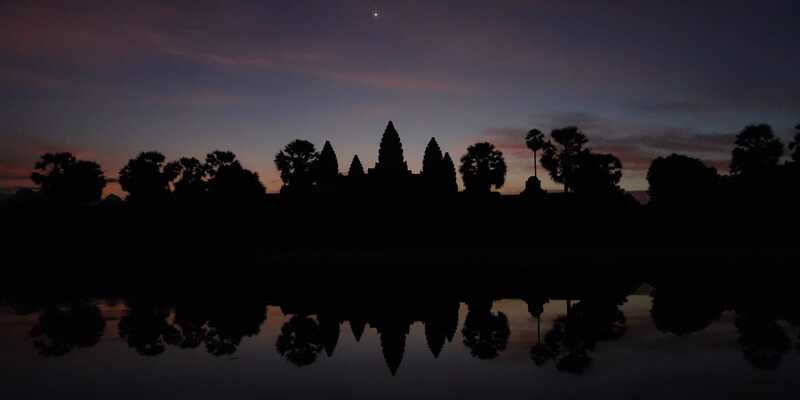 Everyone goes to the ponds right in front of Angkor Wat to watch sunrise. But if you don’t cross the bridge across the large pools in front of the whole complex, you can avoid the crowds and get very nice pictures, too. The view isn’t quite as stunning as from the most famous spot. On the other hand, you won’t have to fight your way to the front and can quietly sit on the wall and watch the sky turn red and orange. This is a very good spot if you’re late because you had to buy your ticket that morning. Instead of rushing through the gates, enjoy sunrise here and come back for the more famous spot on another day.